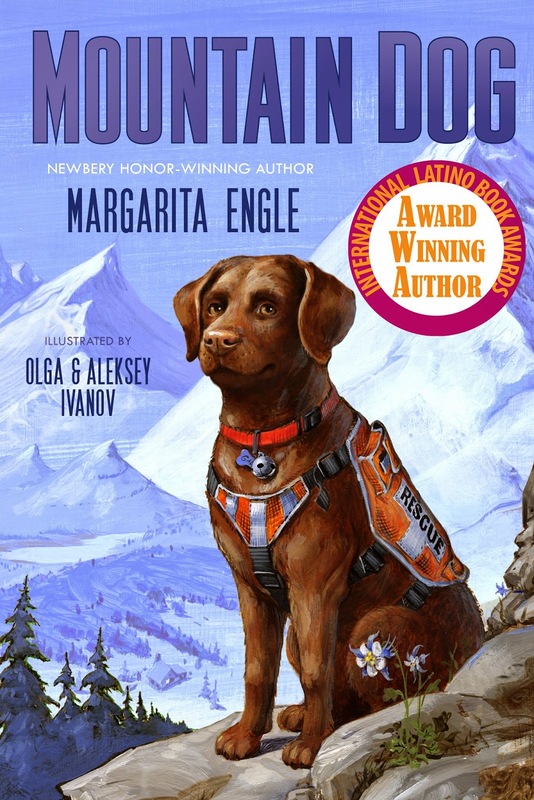 In Engle’s elegant free verse, Mountain Dog relates the story of 11-year-old Tony, whose mother is imprisoned for running a dog-fighting ring in Los Angeles; and his partnership with his Tío, a forest ranger in the Sierra Nevada, with whom he is sent to live; and with Gabe, Tío’s search-and-rescue dog. In alternating narratives by Tony (“the boy”) and Gabe (“the dog”), young readers see how the boy slowly grows from a confused, distrustful, fearful young person to someone who has learned to deal with conflict, inherited his great-uncle’s passion for rescue—and is beginning to know his path. In my other life there were pit bulls. means the earth is warm. On long, cold cricket nights. Tony, you look wishful too. On many levels, Mountain Dog is a story about a boy’s recovering from the traumas of child abuse and learning to trust again, about discovery, about making life-affirming choices and finding his path. And in this, it succeeds, beautifully. As well, Engle has a plethora of details—about wildlife and wilderness, about physical survival in a harsh environment, about selecting a puppy and training a search-and-rescue dog, and about the absolute necessity of mastering mathematical calculations—seamlessly woven into this emotion-filled story of a boy’s coming to terms with his past life and opening himself to the possibilities of moving forward. Olga and Alexsey Ivanov’s black-and-white, pen-and-ink illustrations are appealing and evocative. Some are simply rendered and, where needed, hatchlines add detail and perspective to humans, domestic and wild animals, and the wilderness. On the frontispiece (repeated on an interior page), for instance, we see Gabe’s head leaning into Tony’s left hand, while Tony’s body, drawn in far less detail, faces the other direction. It’s clear that Tony is barely allowing Gabe to make contact—and Gabe is doing what he’s been trained to do, being there, being available, waiting to see what more is required of him. Opposite the first page of text, we see Tony, looking almost directly at the reader. His large eyes are mistrusting—he’s been through a lot—and he’s thinking, as the chapter title says, “no no no maybe.” The book’s final illustration is of Tony’s new puppy, whom Tony will train to be a rescue dog. The puppy’s eyes are also large—open to all the possibilities that await him with his new family. My one problem with Mountain Dog is Tío’s brief story of his childhood and early teenage years in revolutionary Cuba (“the troubled island”): “Strange rules. Censored books./ Rationed food. Secret police./ Neighborhood spies”; his escape from the secret police on a homemade raft during hurricane season, and his subsequent rescue at sea by a fisherman. In truth, the Cuban people had to protect their revolution and defend their tiny country to the death—to prevent CIA-funded counterrevolutionaries, giant US corporations, and organized crime, from taking back the island. At the beginning, life was very difficult and people fled because of the US embargo, which strangled the Cuban economy and caused serious shortages and the rationing of food. As some say today, “teníamos hambre”—“we were hungry.” But, absent any historical context, Tío’s story will lead young readers to think of Cuba as a regimented, controlled country that oppresses its people. Mountain Dog is highly recommended.